COMPASSION: At First Children we consistently put ourselves in other’s shoes, particularly the children and parents we serve, dealing with their own respective challenges. We will demonstrate this compassion and empathy through our daily actions to improve the lives of the children in our care. ACCOUNTABILITY: It is important for us to be consistently accountable to all the stakeholders in our organization, mainly the parents/children we serve, our payers and fellow employees. 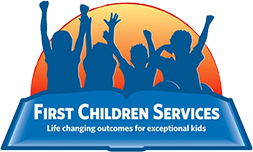 We do this by a daily commitment to our mission, achieving life changing outcomes for exceptional kids. When we do not achieve desired outcomes, we must answer to our children/families, payers and peers. TEAMWORK: To truly fulfill our mission and reach our potential as an organization it takes all employees working together to achieve optimal results. We must encourage collaboration amongst educational, therapeutic and clinical disciplines to do the best for the children/families we serve. When we work together the greatest of challenges are within our reach. EXCELLENCE: Day in and day out we are entrusted with the well being of children. Given the critical importance of that work we can never and will never accept sub par performance. We must all go above and beyond on a daily basis. INNOVATION: We must constantly be looking for new and more progressive ways to better serve our children/families. Simply accepting “the way it has always been done” is not an option. First Children must be leaders in our field by looking to innovate and better improve the lives of our children.